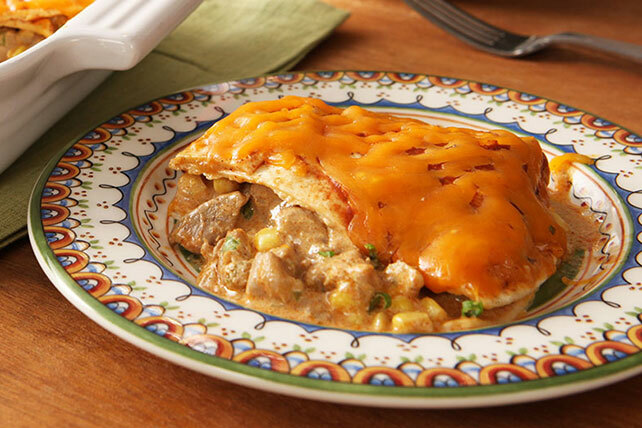 Serve our Chicken Taco Casserole for a savory comfort food dish with onions, corn and more. This Chicken Taco Casserole is ready to enjoy in under an hour! Heat oil in large skillet on medium heat. Add chicken and onions; cook and stir 8 to 10 min. or until chicken is done. Add Seasoning Mix and water; stir. Bring to boil; simmer on medium-low heat 10 min., stirring occasionally. Remove from heat; stir in corn and sour cream. Cover bottom of 13x9-inch baking dish sprayed with cooking spray with 5 Tortillas; top with 1 cup cheese, chicken mixture and remaining tortillas. Drizzle with Taco Sauce. Bake 15 min. or until heated through. Sprinkle with remaining cheese; bake 5 min. or until melted. Serve this main dish with a mixed green salad for a quick-and-tasty weekday meal. For added color and flavor, stir 2 Tbsp. chopped fresh cilantro into the seasoned cooked chicken along with the corn and sour cream. Omit oil. Substitute 1-1/2 lb. lean ground chicken for the cut-up chicken thighs.